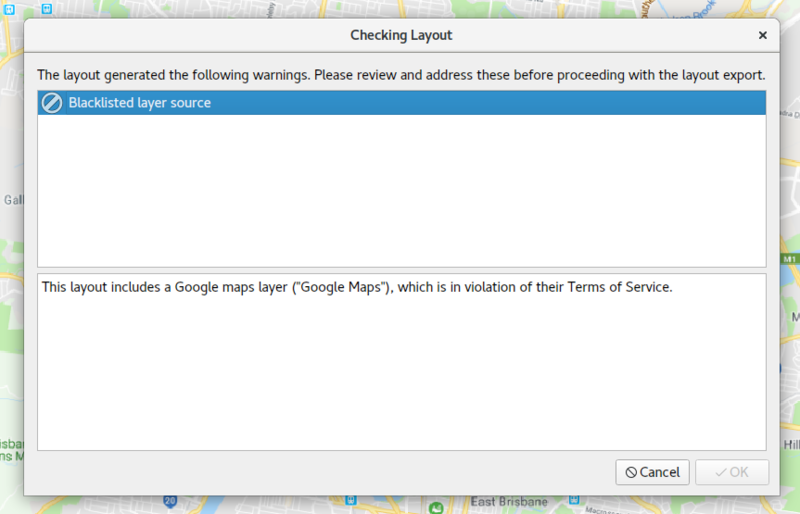 On custom layout checks in QGIS 3.6, and how they can do your work for you! Instead of just making a set of written policies and hoping that staff correctly follow them, it was instead decided that the checks should be performed automatically by QGIS itself. 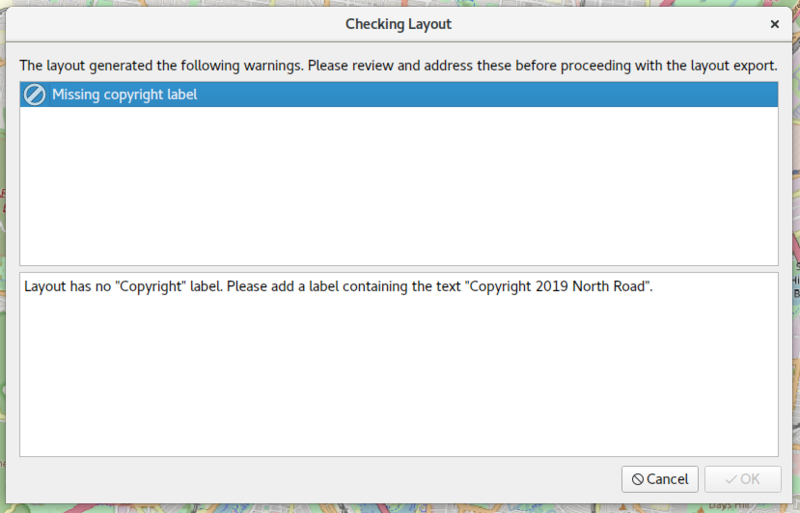 If any of the checks failed (indicating that the map wasn’t complying to the policies), the layout export would be blocked and the user would be advised what they needed to change in their map to make it compliant. 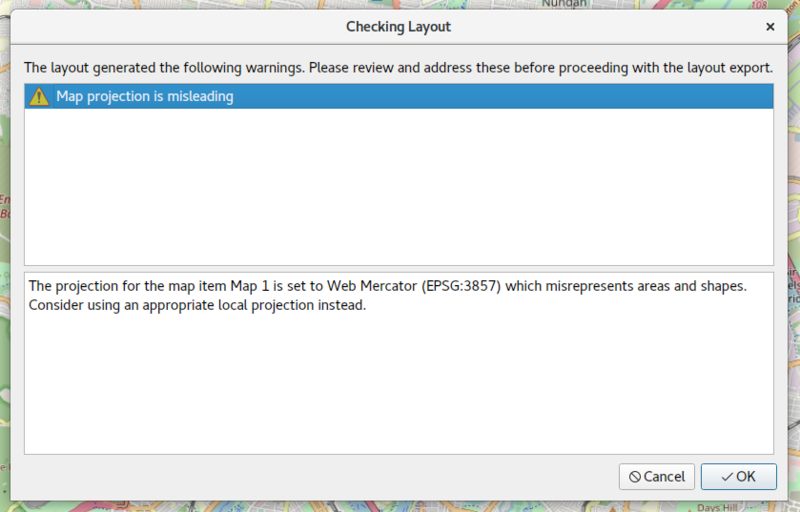 All QGIS 3.6 users will see a friendly warning if either of these conditions are met, advising them of the potential issue. The exciting stuff comes in custom, in-house checks. These are written in PyQGIS, so they can be deployed through in-house plugins or startup scripts. Let’s explore some examples to see how these work. Checks are created using the @check.register decorator. This takes a single argument, the check type. For now, only layout checks are implemented, so this should be set to QgsAbstractValidityCheck.TypeLayoutCheck. The check function is given two arguments, a QgsValidityCheckContext argument, and a feedback argument. We can safely ignore the feedback option for now, but the context argument is important. This context contains information useful for the check to run — in the case of layout checks, the context contains a reference to the layout being checked. The check function should return a list of QgsValidityCheckResult objects, or an empty list if the check was passed successfully with no warnings or errors. Here, our check loops through all the items in the layout being tested, looking for QgsLayoutItemMap instances. It then checks the CRS for each map, and if that CRS is ‘EPSG:3857’, a warning result is returned. The warning includes a friendly message for users advising them why the check failed. In this example our check is returning results with a QgsValidityCheckResult.Warning type. Warning results are shown to users, but they don’t prevent users from proceeding and continuing to export their layout. Notice how the OK button is disabled, and users are forced to fix the error before they can export their layouts. Of course, all checks are run each time — so if a layout fails multiple checks, the user will see a summary of ALL failed checks, and can click on each in turn to see the detailed description of the failure. So there we go — when QGIS 3.6 is released in late February 2019, you’ll have access to this API and can start making QGIS automatically enforce your organisation policies for you! The really neat thing is that this doesn’t only apply to large organisations. Even if you’re a one-person shop using QGIS, you could write your own checks to make QGIS “remind” you when you’ve forgotten to include something in your products. It’d even be possible to hook into one of the available Python spell checking libraries to write a spelling check! With any luck, this should lead to better quality outputs and less back and forth with your clients. North Road are leading experts in customising the QGIS application for enterprise installs. If you’d like to discuss how you can deploy in-house customisation like this within your organisation, contact us for further details! Last week the first official “FOSS4G/SOTM Oceania” conference was held at Melbourne University. This was a fantastic event, and there’s simply no way I can extend sufficient thanks to all the organisers and volunteers who put this event together. They did a brilliant job, and their efforts are even more impressive considering it was the inaugural event! Basically, a new geometry is created for each trimmed section in the output layer by calling the “curveSubstring” method on the input geometry and passing it a start and end distance along the input line. This returns the portion of that input LineString (or CircularString, or CompoundCurve) between those distances. The PyQGIS API nicely hides the details here – you can safely call this one method and be confident that regardless of the input geometry type the result will be correct. Unfortunately, while calling the “curveSubstring” method is elegant, all the code surrounding this call is not so elegant. As a (mostly) full-time QGIS developer myself, I tend to look over oddities in the API. It’s easy to justify ugly API as just “how it’s always been”, and over time it’s natural to develop a type of blind spot to these issues. This is rather… confusing… logic to follow. Here the script is fetching the geometry of the input feature, checking if it’s a LineString, and if it IS, then it skips that feature and continues to the next. Wait… what? It’s skipping features with LineString geometries? Well, yes. The algorithm was written specifically for one workshop, which was using a MultiLineString layer as the demo layer. The script takes a huge shortcut here and says “if the input feature isn’t a MultiLineString, ignore it — we only know how to deal with multi-part geometries”. Immediately following this logic there’s a call to geometryN( 0 ), which returns just the first part of the MultiLineString geometry. There’s two issues here — one is that the script just plain won’t work for LineString inputs, and the second is that it ignores everything BUT the first part in the geometry. While it would be possible to fix the script and add a check for the input geometry type, put in logic to loop over all the parts of a multi-part input, etc, that’s instantly going to add a LOT of complexity or duplicate code here. Win! This is simultaneously more readable, more Pythonic, and automatically works for both LineString and MultiLineString inputs (and in the case of MultiLineStrings, we now correctly handle all parts). What’s that extra QgsGeometry(…) call doing here? Without getting too sidetracked into the QGIS geometry API internals, QgsFeature.setGeometry requires a QgsGeometry argument, not the QgsAbstractGeometry subclass which is returned by curveSubstring. So there we go. The process of writing and delivering a workshop helps to look past “API blind spots” and identify the ugly points and traps for those new to the API. As a direct result of this FOSS4G/SOTM Oceania 2018 Workshop, the QGIS 3.6 PyQGIS API will be easier to use, more readable, and less buggy! That’s a win all round! Prior to QGIS 3, the .qgis/.qgis2 folder was found under your home directory. At version 3, the folder has moved to a more standard profile location for your operating system. I’ve recently spent some time optimising the performance of various QGIS plugins and algorithms, and I’ve noticed that there’s a few common performance traps which developers fall into when fetching features from a vector layer. In this post I’m going to explore these traps, what makes them slow, and how to avoid them. In this case calling getFeatures(request) just returns the single feature with an ID of 1001 (which is why we shortcut and use next(…) here instead of iterating over the results). Why is this a bad idea? Well, remember that every time you call getFeatures() QGIS needs to do a whole bunch of things before it can start giving you the matching features. In this case, the code is calling getFeatures() once for every feature ID in the list. 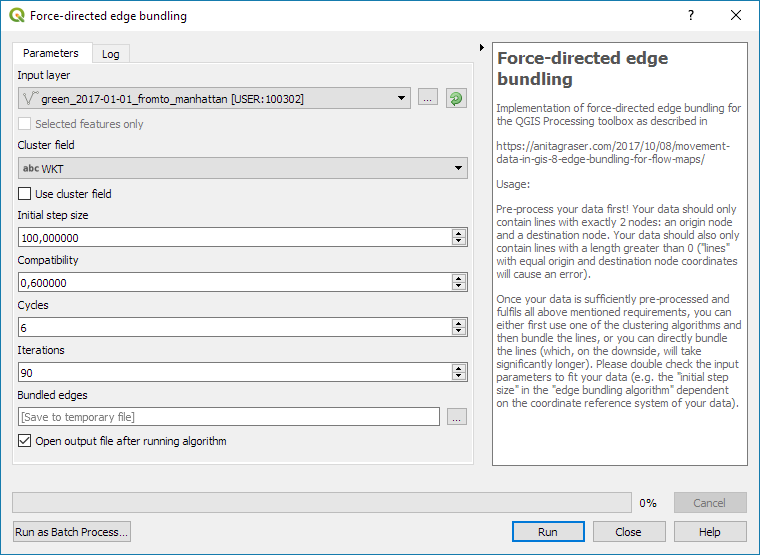 So if the list had 100 features, that means QGIS is having to create a connection to the data source, set up and prepare a query to match a single feature, wait for the provider to process that, and then finally parse the single feature result. That’s a lot of wasted processing! Now there’s just a single call to getFeatures() here. QGIS optimises this request by using a single connection to the data source, preparing the query just once, and fetching the results in appropriately sized batches. The difference is huge, especially if you’re dealing with a large number of features. What’s happening here is that the code is iterating over all the features in the layer, and then skipping over any which aren’t in the list of selected features. See the problem here? This code iterates over EVERY feature in the layer. If you’re layer has 10 million features, we are fetching every one of these from the data source, going through all the work of parsing it into a QGIS feature, and then promptly discarding it if it’s not in our list of selected features. It’s very inefficient, especially if fetching features is slow (such as when connecting to a remote database source). Now, QGIS will only fetch features from the provider with matching feature IDs from the list. Instead of fetching and processing every feature in the layer, only the actual selected features will be fetched. It’s not uncommon to see operations which previously took many minutes (or hours!) drop down to a few seconds after applying this fix. we hand over the bulk of the filtering to the data source itself. 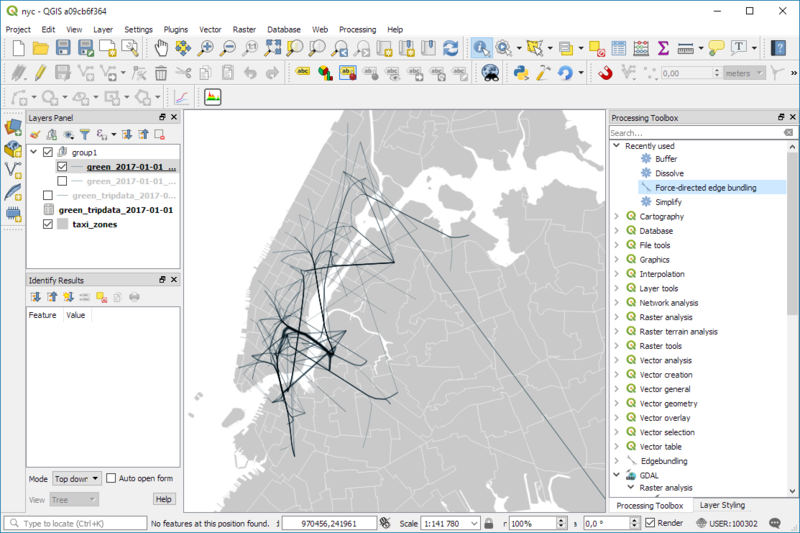 Recent QGIS versions intelligently translate the filter into a format which can be applied directly at the provider, meaning that any relevant indexes and other optimisations can be applied by the provider itself. In this case the rewritten code means that ONLY the features matching the ‘my_field > 20’ criteria are fetched from the provider – there’s no time wasted messing around with features we don’t need. None of the unnecessary geometry parsing will occur, and only the ‘value’ attribute will be fetched and populated in the features. 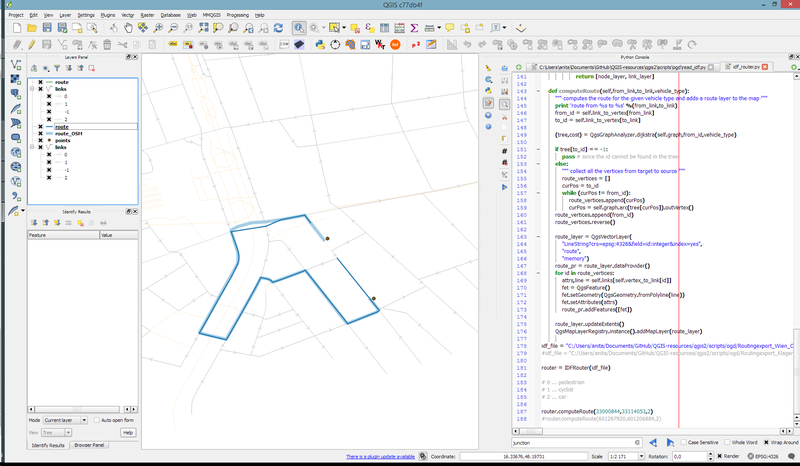 This cuts down both on the processing required AND the amount of data transfer between the layer’s provider and QGIS. It’s a significant improvement if you’re dealing with larger layers. 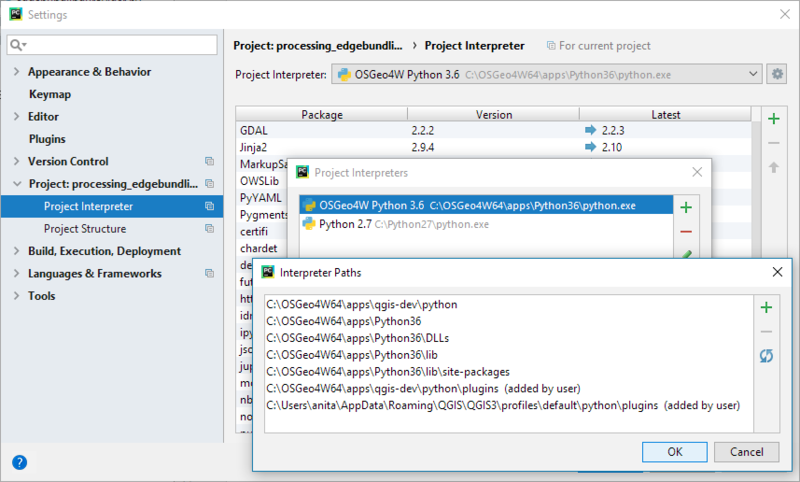 Optimising your feature requests is one of the easiest ways to speed up your PyQGIS script! It’s worth spending some time looking over all your uses of getFeatures() to see whether you can cut down on what you’re requesting – the results can often be mind blowing! The Plugin Builder is a great tool for generating a working plugin project that you can customize. One of the main tasks in the development cycle is deploying the plugin to the QGIS plugin directory for testing. Plugin Builder comes with a Makefile that can be used on Linux and OS X to aid in development. Depending on your configuration, the Makefile may work on Windows. 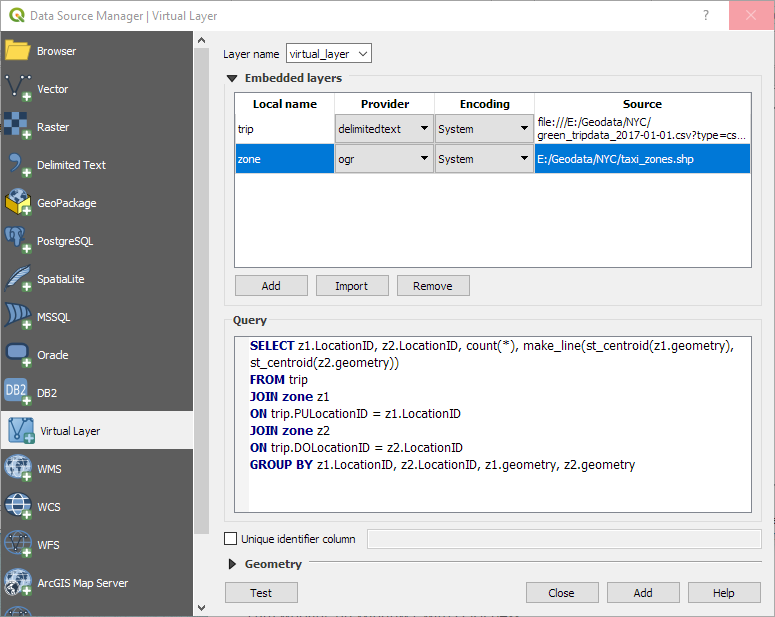 To help in managing development of your projects, we've come up with another option---a Python tool called pb_tool, which works anywhere QGIS runs. # Other directories to be deployed with the plugin. # ISO code(s) for any locales (translations), separated by spaces. The configuration file is pretty much self-explanatory and represents that generated by Plugin Builder 2.6 for a new plugin. As you develop your code, you simply add the file names to the appropriate sections. 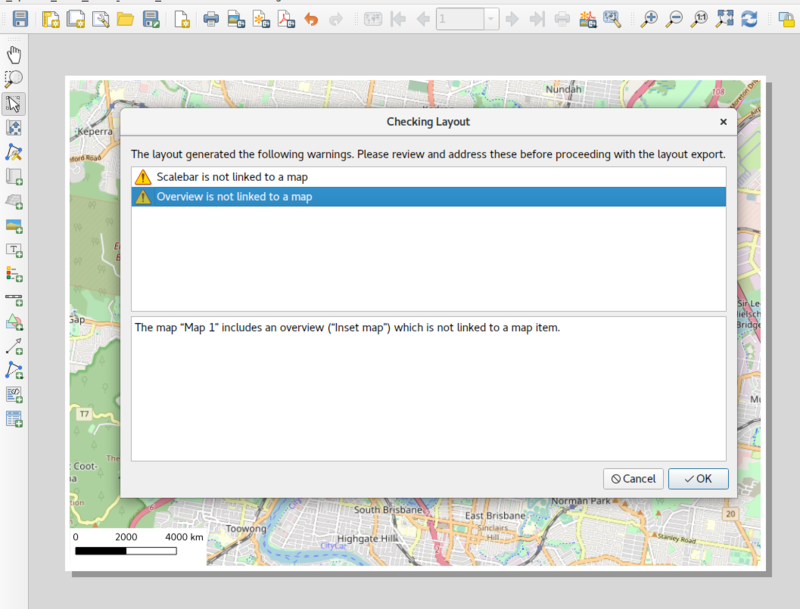 Plugin Builder 2.6 will be available the week of the QGIS 2.6 release. 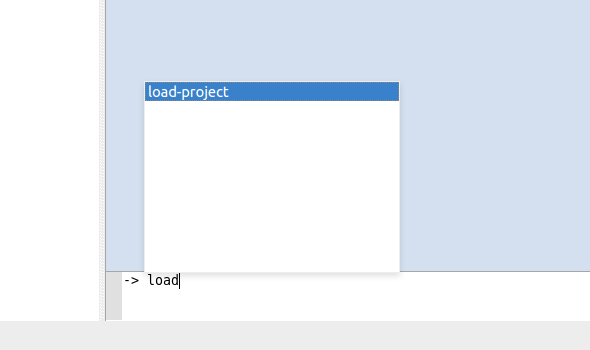 In the meantime, you can use pb_tool create to create a config file. See the pb_tool website for more information. no targets are out of date. The PyQGIS Programmer's Guide is now available in both paperback and PDF. A sample chapter is also available for download. 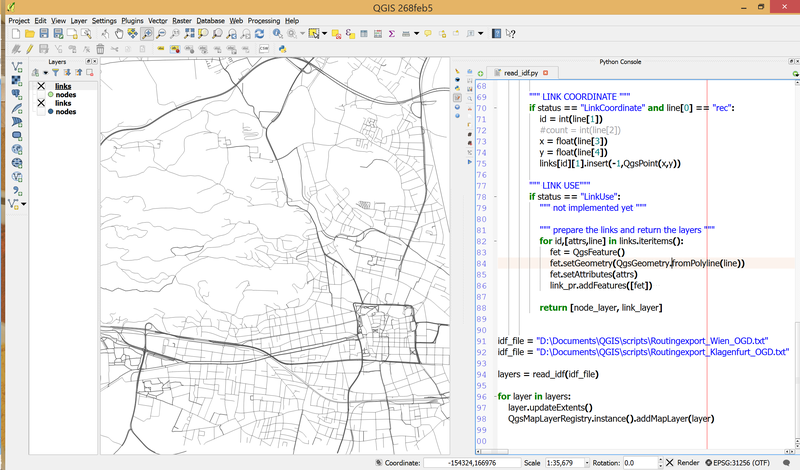 The book is fully compatible with the QGIS 2.x series of releases.